Too long since the last light lunch outing. Definitely too long since the last light lunch write-up, oops. TBF, though, there was the whole episode of TBFTE. You know, all that snow? That was a fun Friday, biking to work over the compacted frozen stuff that covered the cycle path. Today, however, the sun it is shining, yes? Andy's car temperature thingy reads a full 13 degrees, though not entirely sure you can trust any measurement from a VW. Kev's busy busy giving the pair of us permission to pootle past Woodbridge and take the Framlingham turn-off. No left leanings but a righteous right into the early Viking settlement of Campsea Ashe, site of my wedding reception way back when. Past the village store, auction house and pub to park outside the pristine Station House. Thinks: when was the last time we sat for a snack in a station? Andy up the ramp and me up the steps. Super smart421 interior and we can see straight away how this place "combines its historical purpose and heritage with a community function", oh yes. Already thumbs up for WiFi, newspapers and lashings of local leaflets (knit & natter, concerts, the peace palace). 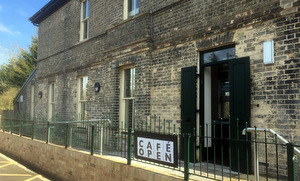 Cafe's to the left serving a carefully chosen selection of savoury and sweet. Helpful lady recommends the homemade leek and potato and garlic soup, yum, with whatever we like on the side. Tasty cheese scone for me, full bacon roll for Andy, going large on the protein. Posh cutlery and ceramics plus a mandatory chilled San Pellegrino. Looked up mid-slurp to see an actual train pulling in -- what a place to bring your train obsessed small child -- since, after all, this is officially Wickham Markset railway station. People get on, people get off, and that fat old sun continues to do its stuff. Understandably, the boy Andy's completely stuffed so only little me to return for decent (and very reasonably priced) choc cake and a top flat white. Everything's very good indeed, and, what's more, they're open until 6pm daily. Did I mention the meeting spaces upstairs? Had a quick chat with the SH folk about the general poor state of other local stations. Wouldn't it be good if other communities could rally round in the same way to bring theirs back to life? If it was a car -- Elddis Accordo 120. If they were passing by -- Michael Portillo.